2014 will be an interesting year from a technology perspective. Not only will it be the year of exciting that exciting new technologies are introduced to the public, it is also the year in which many computer users need to make a decision with far-reaching consequences. Please feel free to leave comments below the article to post your opinion on this. I'd also like to hear your predictions or certainties for 2014. Here are 4 technology certainties for 2014 that will change things around a lot. You did not see that one coming, right? Windows XP is still used by millions every day, and while the operating system has lost usage share percentages, it is still the second most-used Windows operating system. It trails Windows 7 which has established itself as the major desktop operating system ever since it was published in 2009. Microsoft's most recent operating system Windows 8 on the other hand is placed third, but there is a huge gap between the system and Windows XP or Windows 7. Windows XP will no longer be supported come April 2014. What this means is that Microsoft won't produce security patches for the operating system anymore. The consequence here is that Windows XP systems will be vulnerable to newly discovered vulnerabilities, and while there may be mitigating factors, like security software, it is generally not recommended to run the system after that date. Windows XP users can update to Windows 7 or Windows 8 to keep on using Windows, and many may do so as it is the easiest choice. Others may decide to switch to Linux or another free operating system, or keep on using Windows XP regardless of the security impact that decision has. Hard drive capacities are currently maxed out at 4 Terabyte per hard drive. This is mainly caused by the 1 TB per platter barrier that is in effect since about 2010. Seagate has been working on a new technology called Shingled Magnetic Recording (SMR) which breaks the limit for the first time. Instead of aligning data tracks next to each other, SMR overlaps them which increases the capacity by 25%. The company plans to make SMR hard drives available to the public in 2014, starting with 5 TB hard drives. The company has pledged to release 20 TB disks in 2020 using the technology, and while it looks good on paper, prototype reviews have shown that random write and read performance have not been at current levels yet. 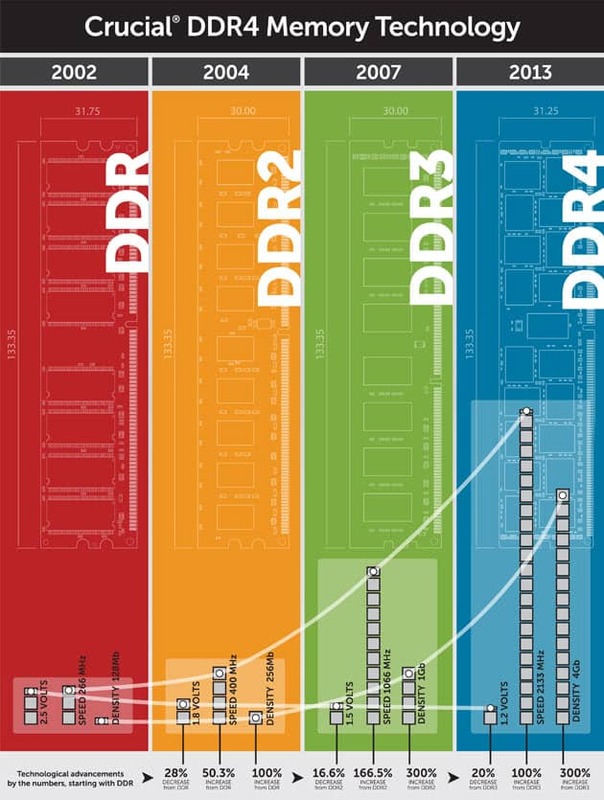 DDR4 SDRAM will enter the computing world in early 2014. According to manufacturers like Crucial, DDR4 memory technology will boost performance and other factors in several ways. The new memory technology uses less power -- up to 20% less -- than current DDR3 memory, and is up to 2x faster than DDR3 at the same time. DDR3, which was introduced in 2007 has been the standard ever since, and it is likely that DDR4 will replace it from 2014 onwards. The new technology requires new motherboards, which means that most computer users will come into contact with it when they buy new systems, build a new system, or update existing systems with a new motherboard and other parts. Samsung's V-Nand technology for Flash Memory will increase the capacities of Flash Memory significantly. The company has been mass producing V-Nand based SSD for some time now, but products will hit the general consumer market in 2014. Samsung claims that V-Nand achieves twice the density of current generation memory products, and that it will improve performance by up to 20% and consume 40% less power at the same time. According to Tom's Hardware, their V-Nand flash technology offers 35,000 program erase cycles instead of the 2000 to 3000 in current products. If you want to read up on what is known about V-Nand visit Anandtech which offers a great overview of the technology. Death of XP: I’ve mentioned it before, but the demise of XP affects much more than desktop users. It impacts industry-oriented machines like ATMs, automation workstations, medical scanner interfaces, etc. Once security patches stop, will we see a wave of attacks on, say, banks which still run XP on their workstations? If a few power control stations get hacked, would a government step in and start issuing XP security updates? Or force MS to issue special infrastructure-user updates? Larger hard drives and faster memory: If a given user spends 90% of his computing time using web tech (high-def 3-D games aside, maybe), then he’s probably not using the speed and storage he can get with a current mid-range laptop. Or so I would guess. Look at the rise of slower, less powerful platforms like netbooks, tablets, and phones. When the market moves toward Atom processors, it means power and speed are not as important as form factor. Who will need this stuff? Big-data crunching, media processing, large-scale simulation programs. Those are the users that will want huge platters and fast DDR. Not to mention faster CPUs. I think maybe 2014 will see a single-purpose phone-sized computer — call Grandma in phone mode, or use an HDMI cable and wireless accessories to turn the unit into a big-screen general-purpose PC. Probably want something more versatile than Android OS, though. Wearable gadgets and tracking themselves on every level of life (Nike Fuel band etc.). Well, maybe those won’t rock the computing world but my bet is the 2014 will be all about that. I do not know enough about it to make the claim that it will be ground breaking. The controller looks interesting, but I’m not yet convinced about it either. I do want to get my hands on one though for testing purposes. The open-source stuff gives things a (potentially) a different dynamic. Linux has a large knowledge-base, and maybe if gaming moves to an open-source Linux-based OS we might see an innovation explosion? Certainly a lot of gamers mention they won’t consider Linux until it does PC gaming as well as Windows. Will SteamOS tilt the balance? Microsoft already hired Velve’s former employee Jason Holtman that should suggest something.They know what is coming. Thanks for the past year, Martin. gHacks is my favorite blog. Cyber attacks will increase exponentially. will be a hot topic. All reports I’ve read say DDR4 will be available on high-end servers in 2H 2014 but not in consumer products until 2015. SATA-Express will arrive in 2014 meaning SSD tech is fully matured. True. However, I have two XP machines that I’ve already disconnected from the web and will continue to use them off-line. I have programs and software that never migrated to newer releases of Windows…and the “run in XP mode” on 7 and 8 does not accommodate most of the older software I have. As far as the internet goes, I have a Windows 8 machine and a CrunchBang Linux machine to keep me in touch with “the world”. “The Death of Windows XP” will not happen in 2014. While it is almost certain that XP market share will drop after April, I’m also certain that XP will be alive and well at least one or two years from it’s predicted death. XP won’t die in 2014 or 2015 or 2016… with now 400+ million users, unless Microsoft will fix it’s disastrous mistake not enabling in-place UPGRADE from XP to Windows 7,8,9… keeping ALL installed applications and data during the upgrade process. This could have been achieved easily by automatically creating a virtual XP PC for those applications that were found to be incompatible with the new Windows OS. From the clients point of view, nothing would have changed as clients would be able to run new and old applications. From security point of view, a contaminated XP puts at risk every Windows 7,8,9…too, as these new OS versions, like XP itself, are no more than Windows NT/2000 dressed in fancy clothing, with the same security holes, as evident time and again, with every monthly Windows security updates. I agree, XP will only die when all old computers have been replaced and that will not happen anytime soon. For the “normal” user it is the applications they want to use that steer what OS they buy, not the other way around. Yep. In 2011 a Cape Town refinery installed 30 workstations and 3 engineering stations running Windows XP. In 2012 a Nigerian oil project — the Usan offshore field — installed a similar control system. Similar systems installed in 2010 run a Florida drinking water plant and a $4.4-billion Chinese refinery. As well as several thousand other industrial systems worldwide. Unless I am very much mistaken, the automation system chosen only runs on XP. These systems are very expensive, and upgrades to software which will run on Win 7 are not trivial. So I bet the majority of these systems will still be on XP on New Years Day, 2015. I remember the panic surrounding Y2K, and the doom-clanging predictions that never materialized. Maybe none of these XP installations will be hacked in 2014. *grin* Maybe they will be. It could be an interesting year. Soo nothing that will change SSD prices significantly yet? I think they will drop further, but would not really expect platter-based hard drives levels in the coming year. Upgrading to a new operating system can be a major undertaking, particularly for businesses which have an extensive network of computers. Windows 8 has proven to be one of Microsoft’s more controversial releases mostly due to its apparent bias towards tablet computers and other devices with touchscreens. However, there are still many reasons why users of traditional desktop and laptop computers may want to consider upgrading as well. Windows 8 presents a wide range of new and improved features – it is not all about the completely new Start Screen interface. With faster boot times, a vastly improved task manager, an improved Windows Explorer and much lower upgrade prices than previous operating systems, Windows 8 does present a range of benefits for everyone. Regardless of your reasons for upgrading, there are various preparations that you should make beforehand. Consider the following factors before you purchase and install the new operating system. Regarding the “death of XP” i always used to say “never change a runing system”. In long term i’m gonna build my own GUI, based on HTML and CSS, so i wouldn’t have to worry, on which platform i’m working. As my desktop-PC is from 2005 i wish a newer machine with somewhat more performance. What about installing Win8, some virtual machines and run XP in a virtual environment? These days we’re running Commodore-64s, Ataris and Amigas under XP an Win7 – so what?! Of course i’m kind of sad about XP’s end-of-life, but crying is not an option. A friend of mine is a professional heavy-user who creates architecture-simulations in 3D, animations and stuff. He tested Win8 and was comfortable with it. The GUI doesn’t matter,- the performance is it! I expect a growing market for developers who build extensions for Win8 to satsfy the demand for the look and feel of XP on recent machines. I am no tech wiz, but have been using XP for years w/out Win Updates w/ NP.& I am not a careful web-surfer.